Dawn light shied clear of Feathergale’s walls and the towers retained their shadows. Aided and abetted by the clouds that hung over the peaks. The sun was a golden fireball rising over the mountain ridge to the east, on a slow climb to meet the clouds. Lord Crick vowed to sweep the army of the living from the slopes before the sun’s face was veiled. In its waking glow, divine light from any holy symbols would burn like a candle flame in the middle of a bonfire. Morning rays fell through the ribs of his soldiers like ghost spears. Crick formed orders in his skull and let the winds take them, relaying them to the troops. His legions arrayed themselves in dense walls. Bone redoubts awaiting the trespassers’ army all along the ridgeline. Flesh and blood and armour ascended to spread their ranks over the slopes below. Men and women clustered in blocks shoulder to shoulder, hedgehog formation with spears thrust forward; riders on horseback gathered in uniform herds at the flanks and centre. Two perfect rectangular crowds formed to the rear, line upon line of bows aiming at the skies. Lord Crick would not wait for the arrows to fly. He raised his sword and dropped his jaw. The winds howled from deep within him, from some heart and lungs he no longer possessed, and crash down the mountainside like an avalanche of sound. The legions of Feathergale charged like a chasing avalanche of bone. Arrows swarmed up from the enemy ranks. The trespasser army advanced en masse. Flesh and blood and armour crashed into bone and shields. Crick charged into the thicket of thrashing limbs and slashing blades. He cut left, he hacked right, he chopped dead centre in front of him. He spun and sliced at a frightened lad who’d snuck behind. The lad fell, the mace dropped from his hands, the fear cast from his young face. Every kill confirmed Crick’s coronation, cementing the crown to his brow. The morning air was heavy with iron. He could almost smell the blood coursing around his veinless frame. It beat in his skull. Like a stampeding pulse. It drummed on the ground. Like galloping horses. Through the bashing, clashing melee the Priest rode. Robes flying behind him, his cursed holy symbol sitting high on the tip of a staff in his right hand. Its radiant glare was barely diminished in the daylight. And it cast a cone of warmth before it, sweeping through the ranks of skeletons like the blade of a plough. Soldiers of Feathergale drew back and sought other prey, parting like a sea of bone just as they had done in the banquet hall. The Knight rode in the Priest’s wake, cutting down stragglers – any who were slow to retreat from the dread Light. Priest and Knight cleared a path – straight through to Crick. Lord Crick felled the last of the human fighters within his blade’s reach, then turned to face the two riders and their precious Light. Once more, its warmth washed over him. Sweet and smooth and stealthy as a half-remembered dream, it seeped into his bones. Defiantly, he swung his sword, meaning to cut the Priest’s horse down. Strangely, he recalled supping at a hot drink, brought to him at his post by a household maid on a cruel winter’s night. The liquid circulated in the vague memory of veins. And burned inside his bones like acid. He watched with eyes of nothing but gloom as his sword missed its target. The horse and the Priest were faint outlines, white phantoms in a world of Light. The Knight and his steed were much the same. A blinding bright blur as they trampled Lord Crick’s bones and raced on past. Defeat. Thieved from the jaws of victory. Sir Dumar Pyrewine had no time to question how the battle-tide had turned. He drove his warhorse on in a reckless gallop down the mountain track. 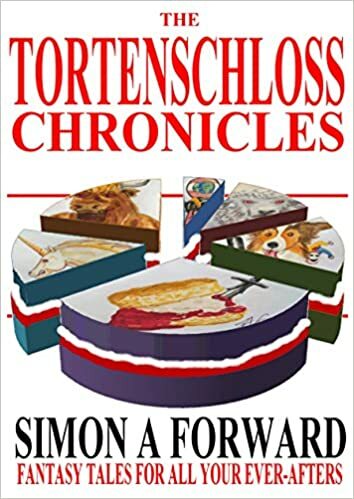 The fine stallion maintained its pace and its footing despite the incline and the added burden of a well-fed Archcleric of Melchor slumped like a sack across the front of the saddle. Sir Dumar subscribed to practical demonstrations more than theory. In practice, as soon as the Skeleton Lord had collapsed another fearsome figure, perhaps some faithful undead lieutenant, had sprung from the melee to strike the Archcleric from his horse. Sir Dumar had just managed to catch the priest and carry him clear. While the staff thudded into the cold dirt and the Light of Melchor had winked out. 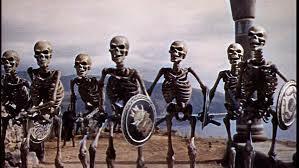 The massed bone legions had, if anything, surged after that, utterly undeterred by the demise of their leader. After this, it would be a long time before they could persuade any other local lord to send a force against Feathergale. It belonged to the dead and would continue thus for years yet. Sir Dumar spurred his steed on, returning to Lysara and the lowlands beyond the reach of these harsh mountain winds. Across the field, a few swords stood as crosses over the unburied dead. Snow Crows landed to feed. A murder of birds feasted on an embarrassment of riches. Feathergale’s fallen had nothing to offer them and the bones were left to find partners, the partnered bones to find other pairs and so on until they had sketched crude stick-figures between them. Snick-snack! Bones locked onto bones, while the crows snacked. Cleaning the human fallen, ready for their service to House Feathergale. The Lord of the House stood over the shattered remains of Crick, loyal servant in life and for many an age in death. And long may his service continue. In some small part at least. There was no doubting Crick’s sword-arm. He had, as Gallows and Thwart had observed, drawn the most blood on the trespassers’ first foray. He shown boldness, leading the legions out to meet the enemy and playing the role of Lord with conviction. He had worn the crown and chainmail well. Of course, the Lord would be reclaiming those. First, the Lord signalled Gallows to stoop and retrieve the limb. Thwart dutifully snapped off the Lord’s arm at the shoulder and Gallows moved in to fit the donated replacement. The Lord flexed his new-old limb, relishing the flexibility, the firmness of grip when he clenched the fleshless fist. No resistance in the joints, just meek, compliant creaks. That was the secret to leadership in Feathergale. His movements were a distant cousin of life, once removed. In that respect, he was no different to any of them. But his joints complained and protested, obeying only grudgingly. As though he had slumbered so long his frame had fallen into disuse. Yet Crick had seen him rise during the battle to stand against the Priest. Perhaps this was a symptom of that weakness that Gallows and Thwart had identified in him. Perhaps it was an ill effect of bathing in the warm glow of the Priest’s holy symbol. The Lord reached his full height with a final jerk of his spine. Dust dislodged from his eye sockets and fell in light, dry showers. He was an imposing figure, despite his poverty of flesh. His eye-hollows were not as hollow as others. The darkness that lurked in his skull appeared deeper, a thing of some substance. Crick considered backing down a step from the throne. But – surprising, he thought – and very little surprised the dead – how much shorter the Lord appeared without his crown. Surprising too, how much taller Crick felt with the weight of metal encircling his skull. He would have picked up his shield, but that would have necessitated a bow. He met the Lord’s nightstone gaze, hollow for hollow. And he drew his sword. He would need a grander blade once he assumed the throne. Perhaps the Lord’s hand-and-a-half sword that gleamed, propped against the side of the throne. Perhaps that Knight’s greatsword should he choose to return and donate it, along with his corpse. Crick’s thoughts were steel. Forged of more mettle than they had ever been in life. If memory served. But it never did. It merely fell in a slow tumble like the dust from the Lord’s eyes. The light had to be right to catch a single speck and even then it couldn’t be grasped with any certainty. Not with such treacherous gaps between fingers of bone. But past was immaterial. Now was all that mattered. Crick merely had to be strong now. This moment. To stand firm, sword in hand. Long as his sword was, the Lord would have to bend to reach it. To bend was to lose. Hollows met hollows, trying to excavate each other. To mine the darkness within. A wordless, weaponless duel. Behind him, Crick sensed Gallows and Thwart skulking in the doorway. Watching. Willing him to win. Lending him their darkness so that no matter how deep the Lord dug he would find more. The Lord’s neck protested louder than any of his other bones as, slowly, he bowed his head. It sounded enough like Crick. Crick stepped to one side, allowing the Lord-no-longer room to step down. Crownless, he descended from the dais and froze at the base. The litter of bones about the banquet hall had finished assembling into a ramshackle congregation. The diverse and debilitated subjects shuffled and skittered, as though uncertain as to whom they should swear allegiance. Crick decided to settle the question. He raised his sword, aligning its arc with the bare-bone neck of the Lord-no-longer. Two voices that weren’t voices bolted from the shadows. Shooting into Crick to ricochet off the walls of his skull. Gallows and Thwart advanced through the throng, stepping over – and on – some of the more prostrate creatures among them. Feathergale does not slay its own, Gallows reminded him. The House wastes nothing, added Thwart, gesturing at the reassembled pieces of the fallen. He will serve us, appended Gallows. He will serve you. Crick looked down on the Lord-no-longer. He turned his once-regal head and Crick saw nothing of menace, nothing of substance in those hollows. Just an old dead fire, raked ashes in a cold hearth. Gallows and Thwart flanked him to divest him of the chainmail. Crick presented his rusty sword, hilt-first. You will take my old patrol. The Lord-no-longer curled ancient knuckles around the blade’s grip. Then he retreated, sloping away across the hall and through the doorway, bound for Crick’s landing. Crick raised both arms, ready to receive the mail shirt. Gallows and Thwart were quick to attend him. As they dropped the garment over his head, the rings of mail snagged once or twice on the thorns of the crown, but Crick refused to remove it even for the purposes of robbing himself. Minor snags or catches were nothing to him. He was Lord of the House. He was Feathergale. Word came at dawn that Feathergale was under attack. Drumming on the earth like a rain of steel and leather. Footfalls and hoofbeats on the mountain paths. They pummelled the dirt tracks, beat down to the heart of the mountain and echoed up through the foundations of the House. Hundreds. Not enough to shake the stone – these walls and halls had withstood far greater storms. But enough to trouble the dust. Grainy clouds drifted down from cracks and crevices and the chandeliers shed motes where they had shed no light for centuries. Crick, Lord of the House, rose from his throne. He moved with smooth purpose. Like the flow of molten steel from the weaponsmith’s forge. He collected his sword – the Lord’s sword. Gallows and Thwart fell into step behind him. The ramshackle cohorts of the Mended followed, shambling, hobbling, scraping and crawling in his wake. He sensed the rest of the Household guard descending from the battlements and high towers, the galleries and landings, the wings North and South and East and West. The House disinterred more guards from graves in the gardens, while others dredged themselves up from their murky beds at the bottom of the moat. As Crick walked, the crown shifted not an inch on his skull. His coat of mail chinked and jangled like a million tiny bells, muted and dulled with age, but shimmered even in the best of halflights the House could muster. How much brighter it would shine in the morning air. At the head of Feathergale’s legions. The trespassers had returned with an army. So Lord Crick marched out to meet them. Conspiracy whispered around Crick’s skull. Of course, it departed via his eye sockets faster than a fly will find its way out through an open window. But the memory of it persisted. It had become part of his thoughts, part of him. He turned his hollow gaze on Gallows, then on Thwart. Why had they chosen to bestow this honour on him? Strength, they seemed to say with their synchronised bows. You, Crick, wounded the female. Against the warrioress, you fared better than any of us. You drew the most blood. But blood does not make a Lord. Ah, Crick, there you are mistaken. All that separates a Lord from a common man in life is blood. In death, he has none, so where is that line of blood to be drawn? Why, from the living, of course. You have proven yourself the best of our warriors. A master at battle should be master of our House. Take the name of Feathergale. Take the crown. From patrolling a deserted landing to throne. From policing spiders and shadows and paint-flaking portraits to presiding over the banquet hall. From Crick to Lord Feathergale. The greatest of promotions. But like an ascent into the heavens or a descent into the Netherplanes he had to ask, at what cost? Angels would ask you to part with your worldly goods and riches before they ushered you through the gates. Demons would demand only your soul. What, pray, did Gallows and Thwart want? In the absence of his eyes, they read the gloom where his brain had once resided. We wish to serve a strong master, a worthy Lord. A Lord worthy of the name Feathergale. Is your neck too brittle to support a crowned skull? Your shoulders too rounded to bear a mantle of chain? Crick, this is your time. Crick, arise. Crick, answer. Crick did not answer. Crick reined in the eddying thoughts and coaxed them together into a picture. It was a grand portrait, alive with the smell of fresh oils: Crick seated on the House throne, Crick clad in shimmering mail, Crick’s skull filling the crown with its regal brow. Lord Crick. Lord Feathergale. Guards bowed to him and swore fealty to him. Crick’s spine straightened. He marched between Thwart and Gallows. He headed to the head of the stairs. Leaving the conspirators to follow. It was what they wanted, after all. It was only right to afford them the opportunity to practice. Would he have to fight the Lord in a trial of combat? No matter if he did. Weak, they said. Crick would finish him as he would have finished the warrioress had she not been dragged from the hall by her knight-friend. Yes, the battle for the House might easily have gone so differently had he been in command. Well, a difference would await the trespassers should they choose to return. Yes, they would meet a new Lord. And the House would draw more blood. You will not need to fight. The Lord is weak and it is not widely known but he sleeps while the House heals. Bone did not lend itself to frowns. Crick was disappointed. No combat cheapened the prize, did it not? There was glory in taking power by force. But to steal it like a thief – where was the honour in that? Very well, he decided. If that was the way it had to be done, so be it. He would lead with honour and that would make amends. Enter, Gallows bade him. And take what is yours. Crick gripped his sword and shield and strode, taller than the curve of his spine normally allowed, into the banquet hall. The House was at work. Bones sifted and shifted. The undead carpeting the floor stirred, bones found bones and mated to form joints. Limbs found sockets and locked into place, skulls found spines or as many vertebrae as they could collect, ribs built cages around nothing. Femur nestled against pelvis, skeletal hands found skeletal arms, skeletal feet scurried like ivory spiders to meet shins. The banquet hall had become an assembly hall. Spare parts built spare guards. Some were legless and crawled, others walked without upper torsos or sans skulls. Some were one-armed, others were un-armed. Incomplete as they were, they were bound by loyalty. They would serve the House in whatever capacity they could. Gallows and Thwart had spoken true. The Lord slept on. Seated with arms rested on the arms of his throne, his head hung to one side and the crown appeared a heavy burden for his slumped shoulders. The carpet of bones clacked and clattered as it shifted and stirred. Crick’s footsteps were only one more set of snicks and clicks among the host of bone-sounds. He advanced, approaching the throne. Glock! Glock! Click! Clack! Glock! Crick approached to within three feet of the throne and his slumbering Lord. At least two feet scuttled out of his path, as though sensing trouble. Crick closed another foot and another. Crick sheathed his sword. Set his shield down at his Lord’s feet. He reached with both hands, his own and his recently borrowed one. His fingerbones curled around the crown and lifted it from the Lord’s head. Crick raised the crown. Imagining himself a priest, ordained by the gods themselves, he lowered the thorned circlet onto his skull. It slipped a degree, metal scraping bone. Then sat, still and comfortable. A perfect fit. The Lord of the House woke. Victory was a thing of stone and hollow silence. Crick lay in the gloom and stillness a while. Just one more pile of bones heaped upon many more. He stirred. The hall groaned like a dead forest in the harsh breath of winter. Or the arthritic near-dead rising from their night’s slumbers. All around him, skeletons rose. Some continued to lie there and would have provided gnawsome treats for the hounds in the days when the court of Feathergale had kept hunting dogs. Crick stood and swayed. His skull housed only the ghost of a brain and yet that gauntleted fist had packed the power to daze. The shock of it still raced a convoluted circuit around his frame like teams of devil horses dragging rattling carriages. His bones felt the hoofbeats, the grind of the wheels and the lash of the driver’s whip. As did the bones that were no part of him. He scoured the littered remains for his blade. A replacement shield. And an arm. There was no shortage of spares. He stalked across the pile. The bones shifted underfoot. It was like treading on a glockenspiel. Glock! Glock! Glock! Hitting many a bum note, producing a dull clunk or a soulless clink. Glock! Glock! Glock! No matter how light his tread. There was his sword, a rusty cross lying on an open grave. Crick stooped to recover it, cut the air with a practice swing. Then he chopped his splintered remnant of forearm off at the elbow. Clean, swift, painless. – to meet his waiting elbow joint. It locked into place, simple as that. Good as old. Crick did not claim the remotest understanding of how the magic worked. If magic was its true name. Mending the dead, it seemed to him, should qualify as miraculous at the very least. Even if the living would fear it as the darkest of miracles. It was a quality of Feathergale. Like the wind, like the dust and the stones and decay and shadows. It was nothing so alive as spirits. But it resided here, nonetheless. In the walls and floors and ceilings, deep in the foundations. Perhaps, over the centuries, it had even sunken roots in the mountain. Either way, it belonged. And Crick and all the other guards belonged to it. It was a power of age and time and Crick thought of it only as the House. He served the House and the House looked after its own. Later or sooner, all these leftover bones would assemble themselves into servants of some descripton. Nothing would be wasted, no bone unturned. But the House worked its darkest miracles unseen even by its guards. Only the Lord of the House would look on from his throne. Crick lurked in the banquet hall, under the watchful sockets of the Lord, just long enough to find a second-hand shield. It was a serviceable target of bronze and leather and it sat well on his borrowed arm. Thus equipped, Crick returned to the stairs. And ascended to his landing to return to his patrol. Resuming his rightful place in the House. Later, they came to speak with him. Two of them. Crick dredged the dry lake of his memory for their names. Gallows and – and Thwart? Yes, that was them. Not their names in life, of course. Memory would not reach beyond that veil to catch that kind of detail. The question of names, of who you were, amounted to minnows, guaranteed to slip the net. No. Feathergale held you together but you had to forge a new identity in death. A new identity to grow old with all over again. Old, old, old. These two had died years before the man Crick had been and when Crick had enlisted in the ranks of the dead they had already risen to the right hand of the Lord of the House. That is, Gallows was the Lord’s right hand and Thwart was right hand to Gallows. They crept towards him, skull-hollows hinting of secrets. Secrets in life, as far as Crick could recollect, tended to pounce. You were ignorant of them. Then they leaped into full and sometimes terrible view. This one stole into Crick like a burglar intent on leaving some new treasure in his possession. Thwart leaned close, touching his fore-skull to Crick’s. Dark travelled from eye-socket to eye-socket like bats migrating from cave to cave. They flapped blindly about their new home, their whispering wings slowly slowly mutating into ideas then into words. Words, Crick suspected, not meant for the House’s ears. The Lord Of Feathergale is weak. We want you to be the new Lord. Crick was honoured. And suspicious. Deeply suspicious. Why did honour feel colder than death?